- And I wanted something that I was interested in eating, but not something that I cooked normally. The first criterion was particularly difficult to achieve; it seemed as though most of the main dishes included meat in one form or another. Dishes like "Italian Spaghetti” (which includes beef or chicken livers) and “Spaghetti Valhalla”(pasta layered with sausage) were thus off the table. I was also struck by the complexity of many of the recipes included. I tend to be quite experimental in my cooking, reading recipes for inspiration rather than following them to the letter. This trait would not have served me well in the Betty Crocker test kitchen. The hot dish I chose to make was a Macaroni Mousse, described as "a deliciously delicate loaf." 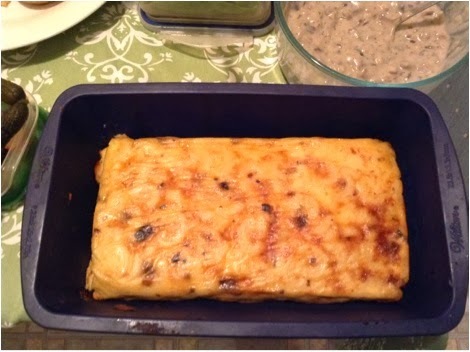 I had never heard of such a dish, and decided it would be a good exercise for my foray into the Betty Crocker cookbook. As I discovered, there are a few differences in the way that I make a macaroni and cheese dish, versus the technique that the Betty Crocker cookbook suggests for the Macaroni Mousse. -While the pasta is boiling, make a bechamel (a melted butter-flour-milk mix) and add whatever cheese I have around, which may or may not include a hardened square of cheddar off a block that I got on sale at the drugstore; the last of the good Parmesan that I got for the bolognese I made to try to impress someone a couple weeks ago; or the end of a raw-milk Quebec cheese that I took home from a wine-and-cheese at school. -When the sauce is thickened, I might also add some vegetables -- frozen peas, caramelized onions, or the baby spinach that's starting to wilt -- and some seasoning (salt, ground black pepper, maybe some chili-garlic sauce). -I drain the pasta and add it to the sauce. -I butter the stained glass baking dish that I “borrowed” from my father's collection a few years ago and pour the pasta in, baking the dish at about 400 degrees until I decide the edges are crunchy enough for my liking. -Scald 1.5 cups of milk and pour it over 1.5 cups of "soft white" breadcrumbs. Some of my breadcrumbs were a little dark, which did show up in the final product, but I didn't mind, although a 1950s housewife may have. -Measure out 2 ounces of elbow macaroni (half a cup) and bring a pot of water to cook it. -Juice an onion. 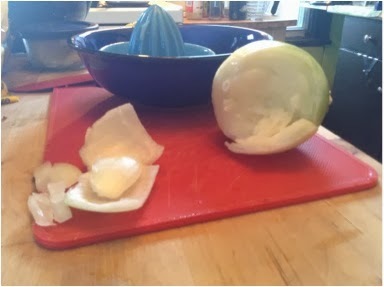 While the cookbook suggests that this can be done with a manual citrus juicer, I found that this wasn't the case and ended up in tears (not from frustration, but from the agony of onion fumes released by trying to extract the onion juice). I ended up with a miniscule amount of juice, most of which stuck to the juicer, and a torn-up onion. I chopped some of the juiciest part of the onion and steeped it in some boiling water. Voilà, onion juice - of which I only needed one teaspoon, anyway. -Add to the milk-breadcrumb mixture: 1 cup shredded "American" cheese (I chose Velveeta, the most artificial cheese I could find in a block at the grocery store); the aforementioned onion juice; four tablespoons of butter; a teaspoon of salt; some minced pimentos (oops, I knew I'd forgotten something at the store); and a teaspoon of minced parsley (for that quantity, I'd planned to raid my housemate's spice rack, but there was no parsley to be found); three egg yolks (save the whites! ), and the cooked macaroni. The macaroni floated in the cheesy sauce, which made me apprehensive about how the final dish was going to taste. -Then, beat the three egg whites until peaks form (I used a hand-held electric mixer, early versions of which were used in the home kitchen from the 1920s) and fold the beaten egg whites into the macaroni-cream mix. -Set a loaf pan with buttered parchment paper inside of it in a pan of water and bake the mousse at 350 degrees for one hour. 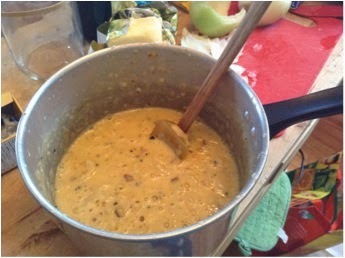 -While the loaf of macaroni is cooking, make a mushroom sauce; brown a cup of sliced mushrooms and some grated onion (luckily, I had onion to spare from my previous juicing attempt!) in three tablespoons of melted butter. Add three tablespoons of flour, and whisk in a cup of milk. Let this thicken, and add salt to taste (which I neglected to do). Was all the extra work worth it? Well, the macaroni tasted fine, particularly with the mushroom sauce, even though the presentation left something to be desired. Ultimately, though, I don't think I'll be making this recipe again. I prefer my own version of baked cheesy pasta, which requires just two pots, a spatula, and a baking pan; no juicer, hand mixer, or any other specialized equipment required. Perhaps I'll make some later this week to use up the processed cheese and leftover mushroom sauce!